Sparsholt College Countryside Day and a very generous donation. A student report of Dutch study trip, 2017. 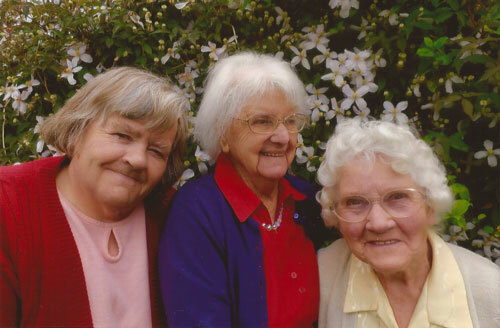 Assisted funding from Focus in on Life. 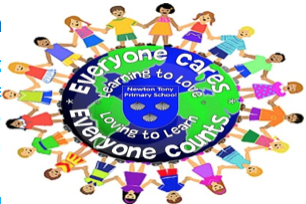 Newton Tony School would like to say a big thank you for the generous grants we have received in the past two years. 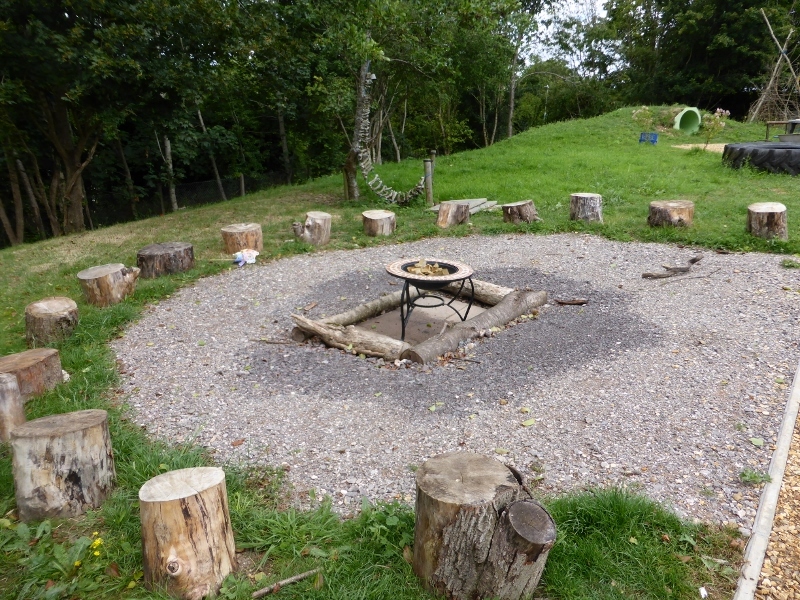 It has enabled us, as a small school to participate in the Pippin Project where the children benefitted from planting a community orchard with apple trees native to Wiltshire as well as engaging with a professional artist and musician. 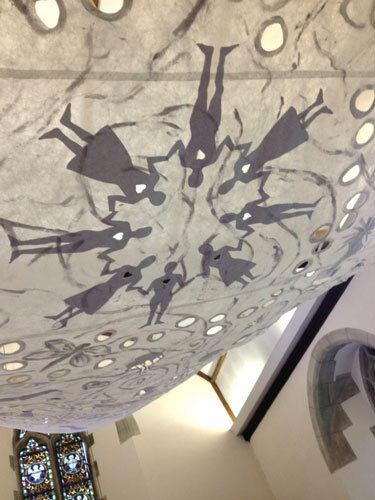 Pupils composed songs and took part in an art project which culminated in a wassailing evening. Focus in on Life are thrilled to be part of this exciting project organised by St Marks School in Salisbury. 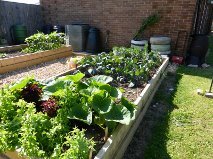 Although the gardens were only started this year the children are already offering their produce for sale in the school shop. 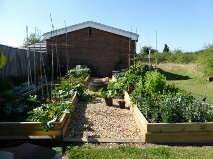 A fantastic effort from all involved in the allotment project. 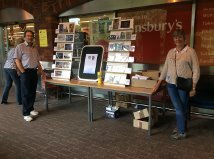 On June 28th Jane and Chris, two of the trustees, kindly ran a stall outside Sainsburys in Salisbury offering for sale George's cards and various hand painted ceramics. A total of £124.50 was raised which was a fantastic result and we are very grateful to Sainsburys for allowing us to hold the stall on their premises. We would also like to thank Splash of Colour in Salisbury and Alison Imlack for supplying and painting the ceramics. 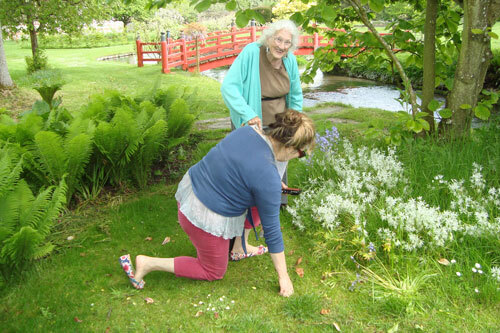 On 14 May 2014 a cheerful group of 8 helpers and 14 senior citizens (some very senior – our oldest member is 103) were take by community minibus and private cars to Heale House for an outing generously funded by Focus in on Life. In ideal weather – warm enough to sit outside, and cool enough for comfort – we enjoyed a splendid meal beside a carrier stream of the Wiltshire Avon before the more mobile guests ventured to explore the beautiful grounds of this ancient estate, aided as ever by our loyal helpers when needed. All too soon – although it was more than four hours later – we had to return to our base at Gloucester House. Everyone was really enthusiastic about the opportunity to experience the wonderful environment in this quite valley, so different from their day-to-day urban life. Our costs were: £94.50 entrance fee; £300 lunch; £75.29 transport; a total of £469.79. The pictures below were taken to provide a record, and to show to our sponsors. We are very grateful to Focus in on Life for their support. Local Artist, Tamsin Loveday, presents her project, THANKFULNESS, for Salisbury Art Trail at venue 42, ST. Nicholas’ Church, WInterslow Road Porton. 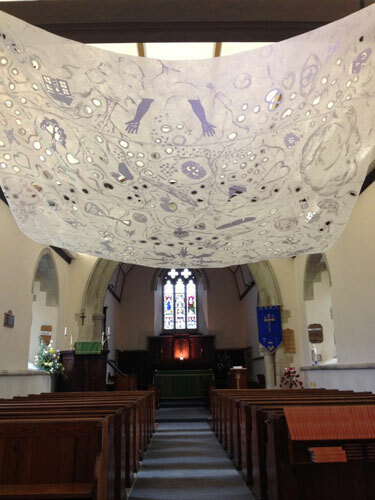 An ambitions scale, site and context specific, sculptural installation combining paper cuts and drawings developed with members of the church. Scriptural and prayerful content make this artwork particularly relevant at harvest time, reflecting a literal and spiritual harvest. Rich visual imagery and symbolism resonate with personal and collective expressions of the Christian faith in this stunning work. Taking the form of a sheet being lowered by its four corners, the curves of the work echo the architecture of the building. An intimate sheltered space is created by the lacy canopy reminiscent of the Tabernacle. 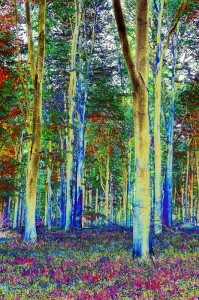 A photograph taken by George was entered in a competition to become the Corporate Christmas Card at Doosan Power Systems. 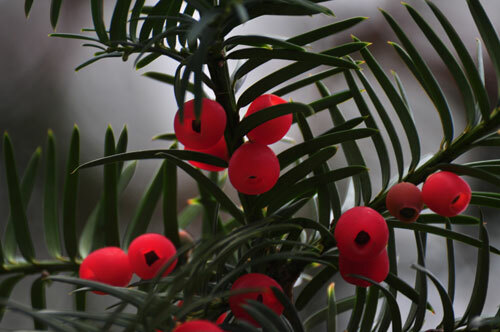 From the many options in George's portfolio we chose the yew tree leaves and berries because of its seasonal appeal and the luminous colours that George managed to achieve from this shot. 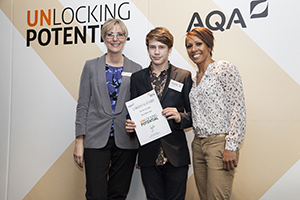 We recently learned that it was selected as the winner and that the prize money is to be donated to Focus in on Life. Doosan is a leading global engineering company with centres in Korea, UK, Germany, USA and the Czech Republic. We are thrilled to have been given the opportunity to exhibit some of George's work in an exhibition taking place in Sarum College in Salisbury. The exhibition "Stewards of the Earth" is being held from September 5th to December 6th. Focus in on Life are very pleased to be able to announce that over the past few months we have been in a position to offer £500 each to seven schools throughout the Bourne Valley, Salisbury and Somerset. 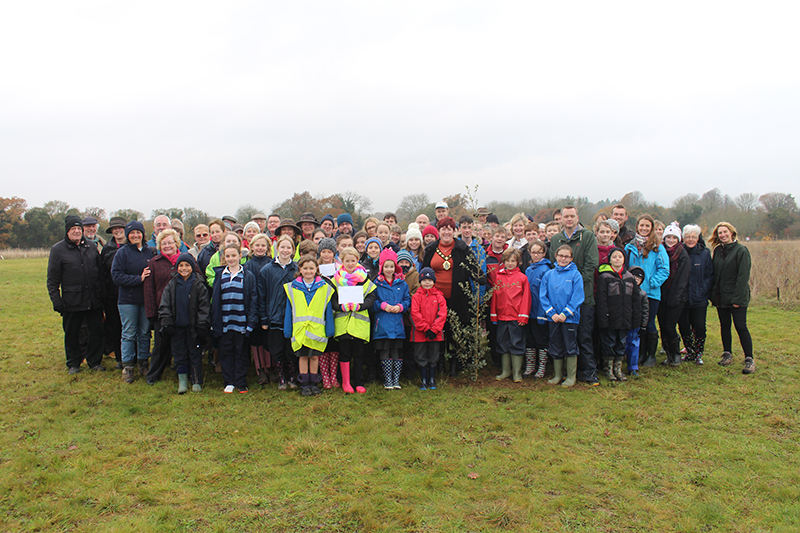 The money will be used to fund ventures such as the planting of an orchard, drama, music lessons and a photography club. We have also offered £200 to sponsor an art project offering workshops to children and adults. We would like to express again our gratitude to all those who have supported us with help and donations, with particular thanks to Harnham Press of Wilton, Hilliers of Romsey, Kiehl's, Whichford Pottery, Kevin Hughes Plants, Heale House Coffee shop, Kings House Coffee shop of Woking, Chris White of Salisbury and Waitrose of Salisbury. 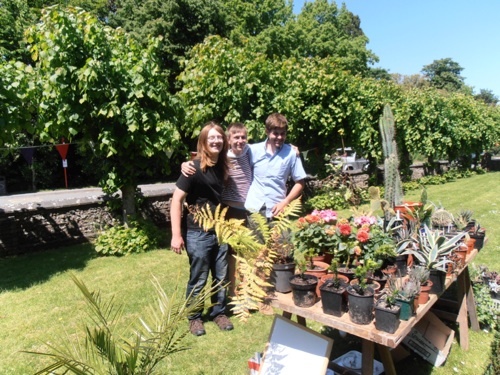 The plant sale which was held on June 8th at St Michael's church in Winterbourne Earls went very well. The weather was beautiful and many people came to buy plants and enjoy the refreshments on offer. Plenty of cards and notelets were sold, along with painted pots and pictures. Once again, many thanks to everyone for all their help and support. 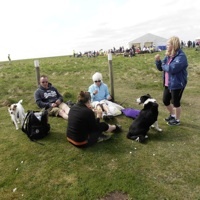 On May 5th Doreen, Tonia, Richard, Alison, Victoria, Ric and Lucy, who are all close members of George's family, took part in the Sarsen Trail. 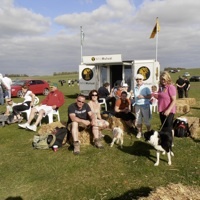 The Sarsen Trail is organised by Wiltshire Wildlife Trust, it starts at Avebury and crosses some of the most beautiful Wiltshire terrain to finish at Stonehenge. 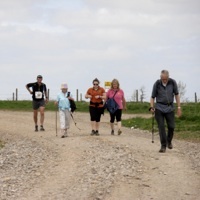 Between them they walked a total of 116 mile and raised a total of £959 for Focus in on Life. This is an absolutely amazing effort and we are very grateful to our family for their support. “Focus in on Life” are holding a plant sale at St Michael’s church, Winterbourne, Salisbury SP4 6HA on Saturday June 8th from 11:00 onwards. 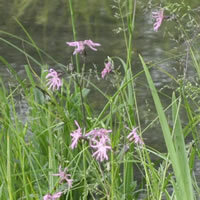 We will have a variety of wild native flowers such as Knapweeds, Campions, Cornflowers and Ragged robins on offer. 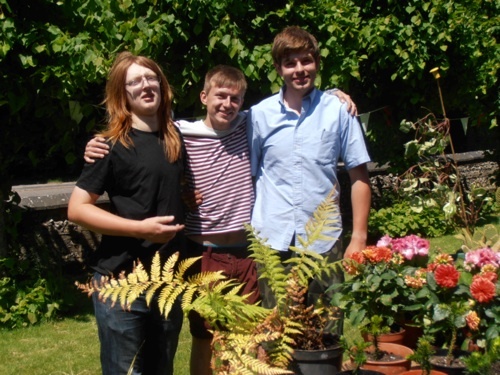 We also have two guest nursery men who will be selling from their wide collection of plants - Succulents, Banana plants, herbs, hardy orchids and bedding plants – just a small selection of what will be available. There will be an opportunity to buy mounted, framed copies of George’s photographs along with cards and notelets. There will be a raffle with some interesting prizes to be won and refreshments will be on offer throughout the day with cream teas being available throughout the afternoon. We are holding an exhibition of George’s photos outside the Salisbury area for the first time at The King’s House Coffee Shop, 14 High St. Knaphill, Woking, GU21 2PE. The coffee shop is a charity in its own right and exists to provide the local community a welcoming and non threatening environment to come for food, drink and social contact. King’s House already sells our notelets, but throughout February the volunteers working there will be hosting our exhibition and taking orders for our photographic prints on either paper or canvas. 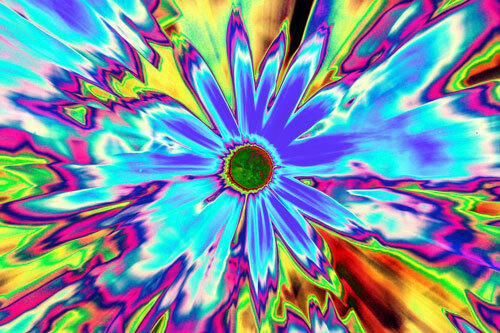 The exhibition will focus on George’s photographs of nature; flowers, butterflies and landscapes, but will also include some of his experimental abstract works. 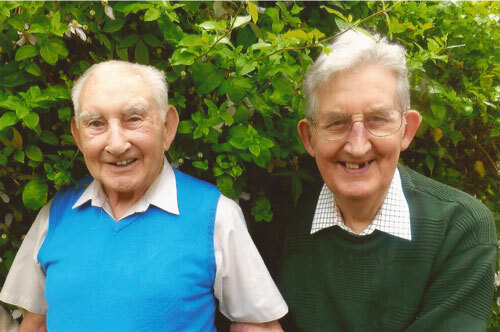 ArtCare, based at Salisbury District Hospital, have offered us space for up to thirty of George’s photographs as part of an exhibition due to begin soon. The photographs will be on view for a month from February 8th onwards and can be seen in the main corridors of the hospital on levels 3 and 4. George had a wide range of interests and he loved to experiment with different photographic techniques, we have tried to include a wide range of photographs to illustrate this. The first event held by Focus in on Life was a four day exhibition of George’s photographs. This took place June 22-25th at St Nicholas Church, Porton, a village North of Salisbury. Thanks to a great deal of help and support from family and friends the exhibition was a huge success. The number of visitors was staggering and quite humbling and we managed to keep a steady supply of refreshments going for the full four days. 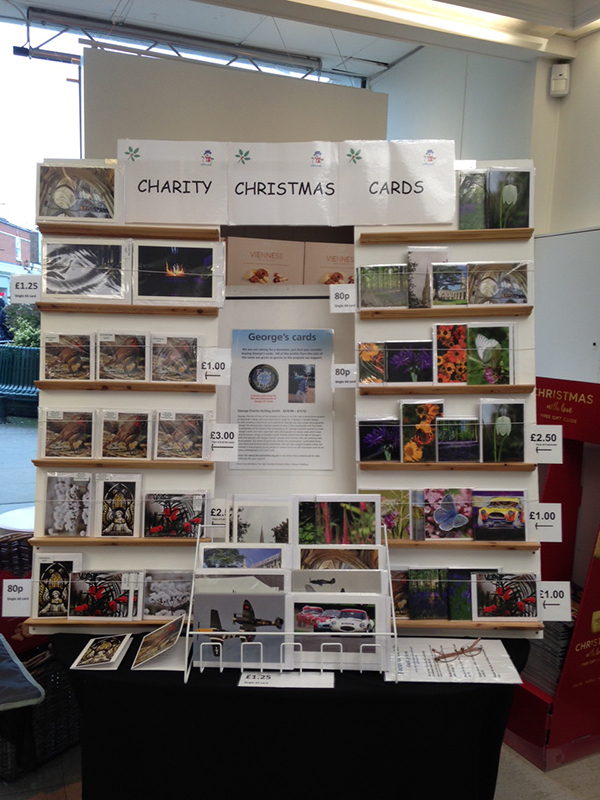 Hundreds of pictures, cards and plants were sold and in total just under £3000 was raised, out of which we were able to make a donation to St Nicholas Church to support their on-going work. The weekend was a very positive experience for all concerned and we were fortunate enough to have the one sunny weekend in June! 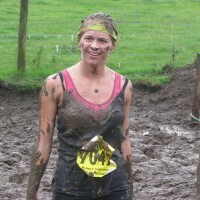 The trustees of Focus in on Life would like to say a huge thank you to Sally Bennett who raised £365 for our charity. 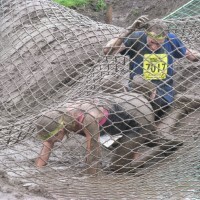 Sally took part in an endurance event, “Total Warrior”, a grueling 10 mile run over and through numerous tricky obstacles on a very testing course in Cumbria on August 5th. 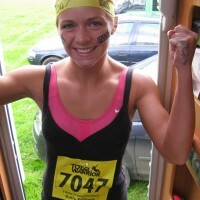 Sally was a member of a team – “Tilley’s Terminators” – the other team members raising money for their chosen charity.